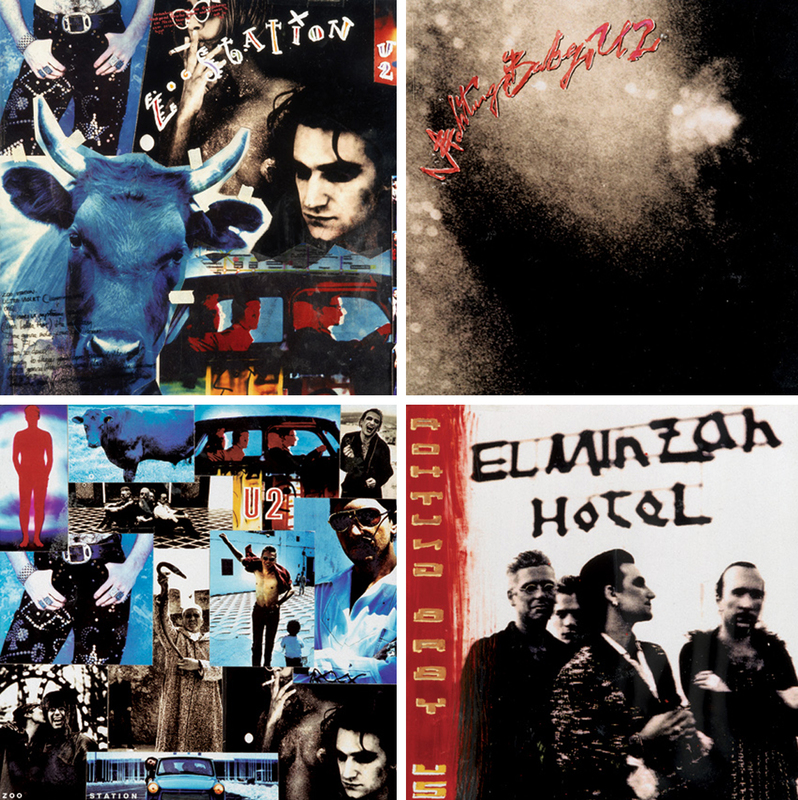 When I first heard the opening salvo of U2 Achtung Baby and the channel flipping darkly distorted sound of Zoo Station, I literally thought that the CD player had broken, or that the speakers had blown, or that we had mistakenly been sent music by another band, it really was that different, that NEW, that un-U2 like. It’s difficult to sum up the days before the internet, wall-to-wall media and the power of online networking – the days before instantaneous speed of the transfer of information. But after U2’s Lovetown tour ended just after the Dublin Point Depot shows and Bono saying that the band would have to, ‘go away and dream it all up again’, there was an almost 2-year silence, broken only by the band’s appearance on the Red Hot And Blue Cole Porter tribute album with their version of Night And Day in 1990 – the first real inkling of the band’s new direction. Otherwise just silence. Then suddenly, The Fly, the first single off Achtung Baby. It was as if a very different door had opened for the band that allowed them to not only sound re-invented, but that also allowed them the freedom to act in a brand new way also. There were suddenly now so many new colours and shades to the band’s palette that it was mesmerizing to hear and to see it happening. 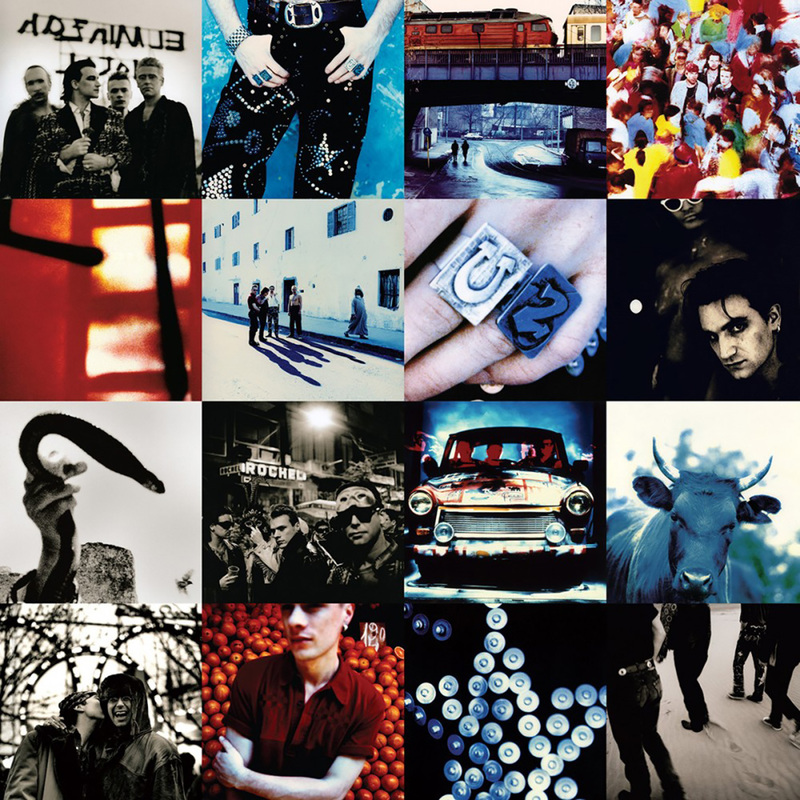 When Achtung Baby was released three weeks later, it was to astonishing reactions. The album had a visceral heat pouring from it. It crackled with brand-new sounds. It throbbed from your sound system with its expansive, distorted metallic textures and deep rhythmic sound with a sheer intensity. Bono’s double-voice, his falsetto and deep distorted low-register vocal spat out words of dark personal angst, sexuality and intimacy unheard before in his lyrics. I was a youngster not too long out of college working with Steve Averill’s design studio Works Associates, when he asked me to work with him on U2’s as yet untitled new studio album in early 1991, my first job for U2. I was used to seeing the panoramic, monumental and monochrome imagery of The Joshua Tree sleeve and so on, but suddenly boxes of photographs were arriving in to us of new U2 photoshoots from Anton Corbijn that were very different to what I’d ever seen for U2. They didn’t have the serious sincerity of his previous work for the band, instead Corbijn had strove for a lighter vibe and the photos were a great combination of spontaneity and of a vivid kaleidoscope of colours from arctic blue to desert red mixed with ink black and sepia-toned lith prints of intense portraiture; of new landscapes, of various animals, of serious masculine men in frocks in full-on wigs and makeup, of band members smiling, fun… and nakedness. There was an astonishing amount of photographs – hundreds of beautifully printed photographs. For us to make a sleeve that would break the mould of any previous sleeves done for band we had to see this as a brand new phase of the band, it had to be quite different from what had been done before. We wanted the sleeve to reflect the multiplicity of themes on the album, its shades of light and dark, its sense of place and time at the dismantling of the Berlin wall. We didn’t want a fashion sleeve, something that would be out of date soon after. We strove hard to make a ‘classic’ album sleeve that would thematically have both depth and meaning and that would go to form the complete album both sonically and visually. No one image was enough to convey the shades and personalities on the record and so out of many experiments we ended up with a regular grid of images with examples shown to the band of sleeves by the likes of Pink Floyd and The Who. This meant that each image on the cover had to carry a lot of weight both in itself and in its relationship between the array in terms of significance and theme. Overall, the sleeve’s chaotic riot of colour was like that of a closeup of the graffitied Berlin wall and the package’s technicolour palette also indicated the album’s lyrical heat and sonic chill. The images are a series of related parts, a deliberate mesh of contrasts and tones, of iconography, of colour and light, of abstraction and of humanity. We searched within photos to find details that became images in their own right, the close up of the door panel of the painted Trabant, the snake held aloft that seems poised to strike a passing bird, the sickle moon, the closeup of the star on The Edge’s trousers and the rings on The Edge’s fingers spelling out U-2. Near the release date, as the album’s recording gained speed so the needle was touching break-neck, word was reaching back to us of further ideas, last-minute song changes and an eleventh hour graffitting of the Windmill Lane recording studio premises stone wall of Achtung babies by artist Charlie Whisker which were quickly photographed by Richie Smyth even as the paint dribbled. These photos made for the CD and vinyl labels. The final days were spent handwriting the band’s name, the album’s name and song titles with ink and pens, brushes, the end of implements, to match the gush of spontaneity and power of the photography. Then in contrast to the unique humanity of the brush and ink lettering, for the lyrics and credits we employed the ubiquitous European font Helvetica that mirrored the repetitive industrial and Germanic themes of the album that also contrasted with the Americana of the title font used on The Joshua Tree, expanded Garamond. The brush and ink came out again before the project’s end as it became evident that certain territories were uncomfortable handling a naked photo of Adam that featured on the back cover of the vinyl format and so we were required paint a large ‘X’ to censor the offending area for those territories. The album’s design was put together in the final days before computers entered our design studio. So the artwork was put together on boards with photos traced into position on trace paper overlays and with all type indicated by us and then set for us at a type-setting house and resized with ‘repro camera’ onto a kind of photo paper then spray glued into position by hand with the aid of a scalpel and ruler. Every lyric or credit change meant for a fresh visit to the darkroom to output a new contact print, stripping the old artwork out and applying the amended piece. The final artwork left the premises along with the photographs themselves to be scanned at the repro house and the resulting scan films glued into position by the reprographics guy – an entire skill and job title that has long since ceased to be. Even as the studio door was closing on the courier collecting the artwork, we were working on turning Charlie Whisker’s graffiti baby into a graphic icon and then coming up with our own – a car and a star for album merchandise. We added hugely to this iconography in the months ahead and by the time of the ZooTV Outside Broadcast and the Zooropa tours, we had a whole library of these little iconic drawings – everything from a fish to a bicycle and from a satellite dish to the baby in a spacesuit helmet surrounded by a ring of stars that became the prototype for the later Zooropa album cover. I have fond memories of us making the packaging for that album. We were aware at the time that this was an important album and that the incredible amount of positive energy coming from all involved was making for something unique and new and even as the final touches were going in place we looked forward to its reaction with great expectation. When it came time to make the re-issue it was like revisiting an old friend. Seeing the photography again with new eyes it’s as good as ever. The themes, the details and connections we made then 20 years back in the packaging they still look fresh. We treated this re-issue project with respect, the photography, pristinely restored, was presented large, the artwork laid out with care. We wanted the packagings to have heft and to resemble physically the weight that this album emotionally carries.